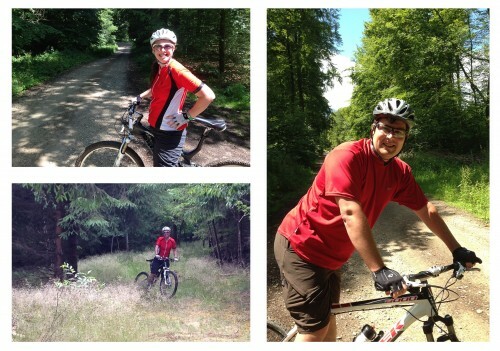 June found us missing our friends but pushing ahead with the normal fun things that we like to do in Luxembourg. First up was the Tour of Luxembourg, which is the annual five day cycling event held around Luxembourg. I took two days off so we could make enjoy as much of the racing as possible. On Friday, we decided to ride our bicycles to the race, which was something we haven’t done in the past. Not only that, but we attempted to ride up the big climb of the day, thinking that the road would be closed to cars in advance of the race. No such luck… we had to fight the cars all the way up the hill. Will “fell off the back” about half-way up, but I continued to push. Finally, I could take no more and pulled off the side, not realizing I was a mere 100-200 meters from the top. The hill thwarted me. I just know if my best coach Rachel had been with me I could have done it. Both Will and I vow to try again in the near future. 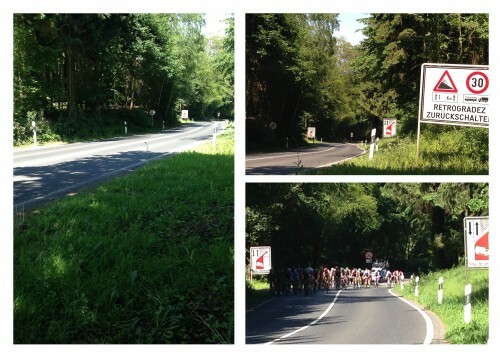 It was somewhat consoling to see professionals and semi-pros also struggle up the same hill later. Of course, they had been riding for over a hundred KM at that point… so really, my struggle and theirs are not the same at all! Notice the 14% grade? Yeah, it was a big, tough hill. 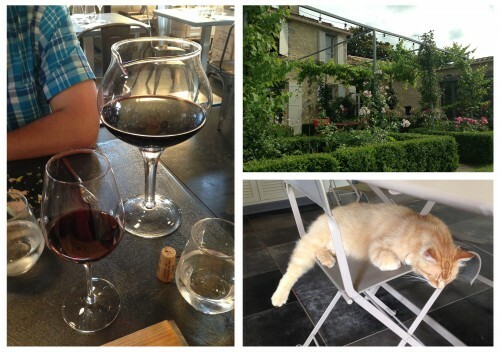 In mid-June we took a vacation to Bordeaux and San Sebastian. 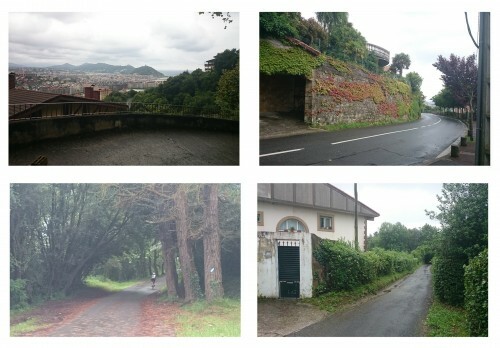 We drove and took our bikes with us, because we knew San Sebastian was a great place to relax and to cycle. But first, we wanted to go to Bordeaux and visit some of the wineries we enjoy buying from each February at my favorite wine event. I booked two nights at a winery we enjoy and then planned to see two others. We arrived after a long day of driving and relaxed in the gardens outside the chateau. Our hosts suggested a local restaurant for dinner, which was fabulous. The place combined dining and shopping for wine. Instead of a wine list, you roamed around the facility to find the bottle you wanted to try. Then, if you liked your choice it was easy to purchase more on the way out. Perfection! I fell in love with the silly decanter. The vineyard grounds were lovely and relaxing, plus they had a very friendly cat. 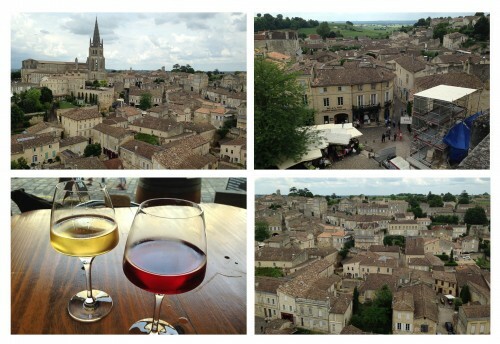 The next day we headed into Saint-Emilion, a well-known town in Bordeaux that is famous for wine. In addition, it also has an amazing monolithic church which is open for tours. We wandered around the town, drank many glasses of wine, and enjoyed the great views. We were excited to try a recommended place for dinner, but there were no tables available. So we tried another recommended place. Again, nothing was available. After the third strike, I suggested to Will that we return to the restaurant from the night before. The food was excellent, plus it was close to our lodging. Will agreed with my plan, which meant another night of tasty dinner! The next morning we departed for Spain. 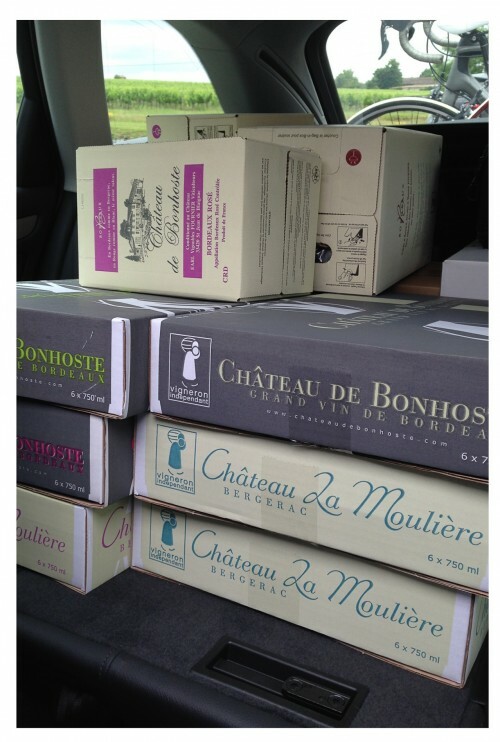 Before we left Bordeaux, I wanted to make a stop at the winery that is my favorite, Chateau de Bonhoste. When we arrived, the place looked closed. Will asked kindly if I had confirmed the opening hours. Fearing a failure, we approached the tasting room to see a buzzer and the hours – the tasting room was open! Before we could buzz, the friendliest but dirtiest vineyard dog appeared out of nowhere. She was so happy to see people and very happy to have some pets. 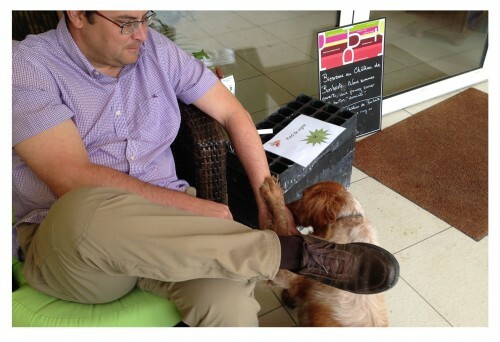 Eventually Madame Colette arrived to offer us some tastings, although we assured her we were very familiar with her wine. I was at a bit of a loss, as she only spoke French, but she and Will got along like peas and carrots. Before we knew it, we were taking a case of this and two cases of that, and why not a case of this over here? Buying wine is turning into another hobby for both of us. Next, we needed lunch before departing Bordeaux. Could Madame Colette recommend a restaurant? Of course she would be happy to! While this one and that one were closed, perhaps this place would suit? She ensured it would have excellent food….and since we were going there, would we mind doing her a favor? Apparently, she needed to do a bulk wine delivery to the establishment and it was going to be a bit difficult, with her family away at another wine event and her granddaughter under her care. No worries! we said, and proceeded to add her wine to our own purchases. The car was quite full when we were finished. Madame Colette was generous with some “cadeaux” (gifts) for our trouble. In addition, the restaurant was wonderful and we had a fabulous meal. Driving down to San Sebastian on Sunday, we had lovely weather. 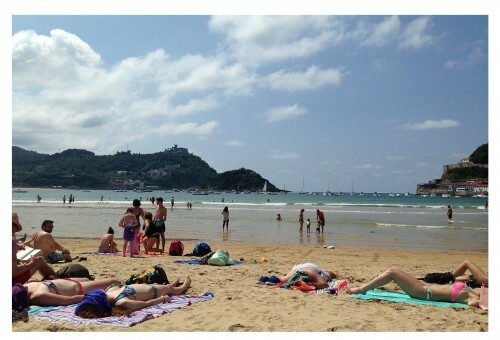 That would be the last time we had perfect weather until the morning we left San Sebastian. To be fair, we did have one day of sun that allowed us a couple hours on the beach. But for most of the week, it was cold, it was rainy, and it was not the holiday I had anticipated. Still, we brought out bikes – so we were going to ride! Will planned an introductory route into the hills for Monday, which was beautiful. It rained on us. Will found us a beautiful place to cycle. If only it had been sunny! We had to deploy the fan to dry out our cycling kit. Will organized a shorter, hilly climb with the most frightening descent I have ever encountered on Tuesday. It rained on us. The downhill would have been scary on a dry day but on a wet day it was nerve-wracking. Wednesday, the skies were grey but the forecast said it would not rain. We decided to do a longer ride with more challenges, but the ride was still intended to be reasonable. The ride was not reasonable. The hills were steep and long, there were 2,000 of them, and it nearly killed us both. 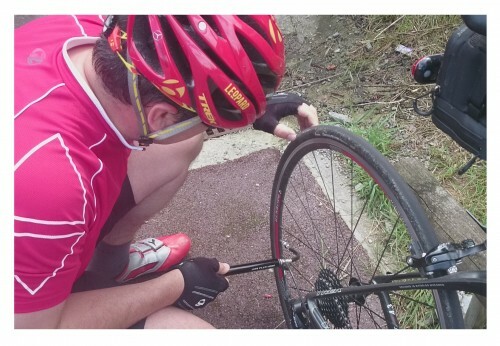 The hills… the hills just kept coming…..
Plus Will got a flat, which just added insult to injury. When we woke up on Thursday to a forecast of mostly sun, I declared that we were taking a day off from the bike and that we were going to see a bit more of San Sebastian in the sun. We did a walking tour of the big hill and then later spent a couple hours on the beach. Finally, some time at the beach!. It looked like our weather was getting better and both of us were excited about one more day of cycling on Friday. Of course, that meant we woke up to cold and rain Friday morning. We decided to relax in the apartment and take care of various computer chores, which actually made the day okay. 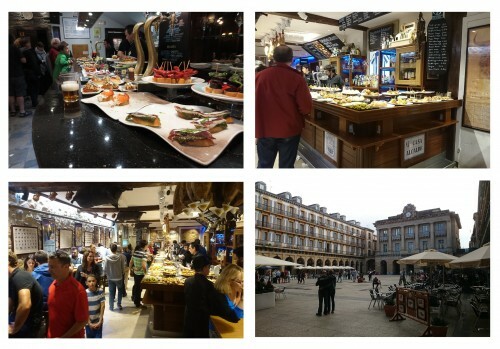 While the weather in San Sebastian was terrible, the food was fabulous. We ate pintxos (the local name for tapas) almost every night, except the night when we had a lovely three course meal with wine for a rock-bottom price. 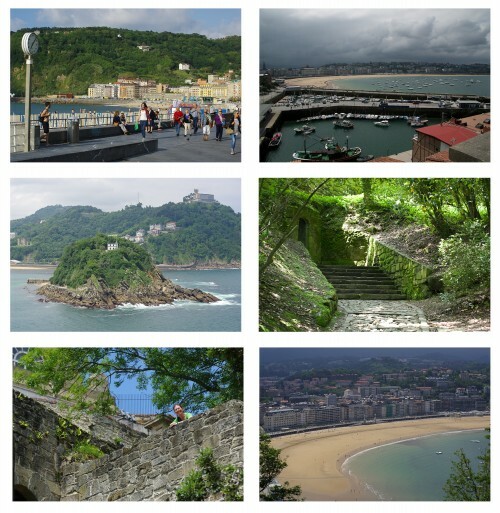 Walking around the old city was a pleasure and we would happily go back to San Sebastian again. Although I’m not sure I would want to take the bikes again…. 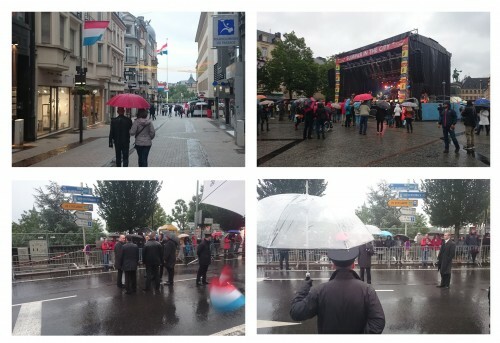 We returned to Luxembourg just in time to celebrate National Day. As you know from past posts the best part of the celebration is the night before. Unfortunately, the cold and rainy weather followed us from Spain and the evening was miserable. I was bound and determined to experience some of the festivities, knowing that time living in Luxembourg can be fleeting. Will and I walked around for a bit, getting more and more wet, until I decided that we should just park ourselves on the parade route, stand under the umbrella, and wait on the small children with torches. After a bit, the police starting behaving unusually right in front of us. Then, clear umbrellas were handed to two young officers. I said to Will “I bet we are going to see some royalty.” Sure enough, a giant Audi pulled up and stopped directly in front of us. Before I knew what was happening, the Grand Duchess Marie Teresa stepped out of the back seat. She looked at me directly and said “bon soiree.” I replied in kind, giddy to be so close to the royal family. Oh heck, words can’t describe it. To the video! After our run-in with royalty and watching most of the parade, we decided that we needed to warm up before the 11:00 fireworks. Normal people would go to a pub or a restaurant… but we chose to go back to my office, relax in the quiet, and have hot chocolate. 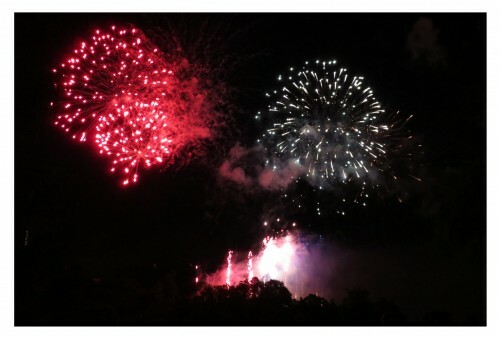 Happily the rain stopped just before it was time to go out and see the fireworks. Will found us a perfect vantage point to view the always-amazing display. In late June, we had the opportunity to enjoy a small concert at the US Embassy. Both Will and I enjoyed the music and it was nice to visit with some newer friends during the reception afterward. 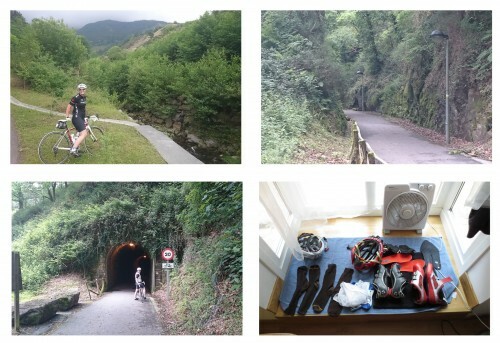 We finished out the month of June cycling around Luxembourg and turning an eye toward the upcoming 4th of July celebration. Until then! I’m so bummed that you had such rainy weather in San Sebastian. I’m glad that you made the best of it and still had a nice time.